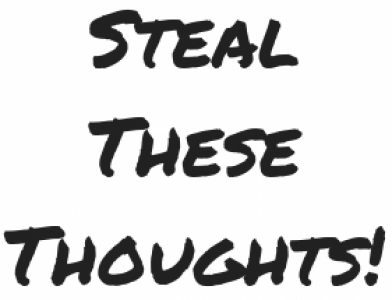 What’s hot in L&D today – Steal These Thoughts! The skills we need to succeed! There’s been lots of social posts, blog posts and such on L&D teams needing to take a better look at their own skills and make sure these are fit for the world today. It’s an important conversation, as how can we expect to deliver great service to the people we support with learning, if we are not skilled in the ways of the world today. Most people will think this all about technology, but it’s not. Yes disruptive technology plays a big part, yet it’s more than that. We have a number of expiring, evolving and emerging skills in our own profession that we need to reflect upon and put plans in place to make sure we are ahead of the curve. Of course many of you reading this will know this already and I’m not going to be another captain obvious who says the same thing and leaves you with nothing. Instead of me pointing this out and saying L&D teams need to change and leaving it at that. Let me help you answer the question – how can I upgrade my skills for the modern world? I’ve written a number of in-depth pieces on the skills L&D teams need in today’s world and how to build these yourself, plus looking at why we need to practice what we preach when it comes to our personal development. I believe both can be of help to you in this journey skill development. The mythical learning culture – how do we guide people on how we learn today? I feel learning cultures are like Unicorns. The movement of building continuous learning cultures has been on trend for sometime now, but I’m starting to question if this an effective way to promote a healthy approach to learning? The research across our industry and the evidence I see with my own work seems to suggest not. What does look to be more effective, is building connected learning e.g. helping people find the right content and not just giving them more content. I reference this Netflix analogy often, in that it’s a great platform with so much great content, but I struggle to know or make a decision on where to start. This feels familiar to me in L&D, we have lots of great content and to build a self serve mentality we are eager to just share everything with everyone so they can make their own decisions, but this doesn’t always feel effective. It’s great that we have access to all this content, but where do we start? What’s relevant to me? You might have 30 resources on X, but what are the ones that will help me, can we help identify the top 5 a person would need to get what they want? So for me it’s looking at what can we do to make the experience more personalised of course, but also connected. Let’s look more to how do we connect people with what they actually need as opposed to here’s everything we’ve got on X and figure it out yourself. I feel there’s more we can do as an industry to help people understand not only the methods to learn, but which are the channels to work best for them as an individual. It goes beyond just talking about 70:20:10 as let’s be honest a lot of our audience don’t care about that. What they do care about is being able to learn and for us to show them how they can learn in a way that is as simple for them as scrolling through content on Instagram. A big theme for me at the moment is connection and making ‘things’ more connected. I’m starting to see the downsides in promoting a straight out continuous learning culture, so I’m looking to how I can turn that into a more connected learning experience and I feel this is something our industry is taking a closer look at too. I told you I was obsessed with connected experiences at the moment! I’m seeing a bigger focus on the overall HR experience across the industry recently and it’s great to see this conversation growing. Providing people with better experiences, specifically better connected experiences within the wider HR world, has always been something I’ve been trying to work towards in my own little patch of L&D. You see, people don’t care about our fancy learning architecture or ecosystems, they want a simple user experience with straightforward accessibility. How frustrating is it to need to use several different systems to access details such as pay, holiday, HR policies and L&D resources? It’s quite common in many organisations, even with those who have the best intentions in buying a single package to try to make one platform do it all. However, it doesn’t have to be that way. It is completely possible to have several disconnected tools from a back-end perspective yet make the front-end experience appear connected. This is something that Josh Bersin has been talking about a lot in the past few months, with the concept of the employee experience platform. It’s not about buying more tools or a singular platform to provide one experience, it’s about how you can connect your existing best of breed tools into an experience in which the user can use simply. I feel working towards a world class connected HR experience is going to become a growing movement over the next few years. How do we provide an end to end, connected experience across the HR world that is simple for our people? A somewhat passion piece of mine of late has been talking to people about the value of L&D to any business beyond capability. In my opinion L&D can and does offer much more than just a ‘capability’ function. Of course, capability is what L&D is commonly known for in businesses, yet it has a lot to offer in supporting talent attraction and retention too. I feel many organisations under utilise the power of their learning offer when it comes to attracting talent and keeping that talent too. I’m not going to lay out all of my thoughts here, as in true ‘me’ fashion, I’ve already written an in depth piece on this which you can read here. I encourage you to think about how L&D influences the overall talent lifecycle in your business and the opportunities we have as learning professionals to create a great connected HR experience for everyone. The impact of our work can most certainly start before someone even joins our business and will still be felt when they leave. These are the big things on my mind as of April 2019. This post has no real purpose apart from me brain dumping my thoughts and feelings out loud, but I’d love to hear what’s on the radar for any of you who’ve taken the time to read this.